Nissel Weissmann, née Saklikower (1869 – 1942) lived at Lindenstraße 17 (today no. 29). She was widowed and her sons Emil, Otto and Walter had emigrated to Belgium and France. Otto and Walter were deported by the Nazis and lost their lives. Emil managed to flee to Corsica. 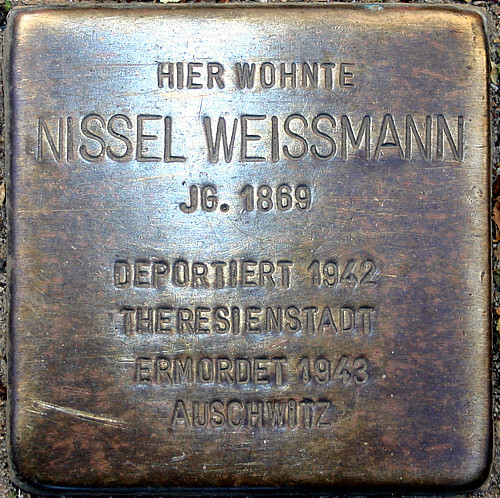 In 1942 Nissel Weissmann was first sent to Theresienstadt and from there deported to Auschwitz, where she was murdered in 1942 at the age of 73. Her daughter Herta was married to the so-called "full Aryan" Max Vater and could survive the holocaust in this "mixed marriage".